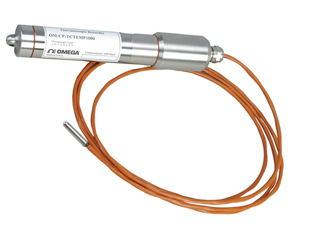 The OM-CP-TCTEMP1000 is a rugged, waterproof, battery powered, thermocouple based temperature recorder. This is a stand-alone, compact, portable, easy to use device that will measure and record up to 16,383 measurements per channel. The storage medium is non-volatile solid state memory, providing maximum data security even if the battery becomes discharged. Its real time clock ensures that all the data is time and date stamped. The device can be started and stopped directly from your computer and its small size allows it to fit almost anywhere. The OM-CP-TCTEMP1000 makes data retrieval quick and easy even from harsh environments. Simply plug it into an available COM port and our user-friendly software does the rest. The Windows software converts your PC into a real time strip chart recorder. Data can be printed in graphical or tabular format and can also be exported to a text or Microsoft Excel file. Nota: Operator’s manual is included with the OM-CP-IFC110 Windows software and RS-232 cable (software is required to operate the datalogger and is sold separately).